.NET is an essential component of many applications running on Windows and provides common functionality for those applications to run. For developers, the .NET Framework provides a comprehensive and consistent programming model for building applications that have impressive user experiences and seamless and secure communication. Our extensive library of.NET training tutorials is geared towards the developer working in the .NET Framework: ASP.net, Visual Basic.NET, C#.NET applications. Mentoring provides personal access to our talented corps of expert instructors in a unique collaborative environment. Students can correspond with the Instructor Team 24x7. Getting Started with WCF 4. WCF 4 Contracts, Behaviors, and Data Management. Securing and Managing a WCF 4 Application. Discovery, Routing, and RESTful Services in WCF 4 Applications. Getting Started with ADO.NET 4 Connections and Commands. Managing ADO.NET 4 Connections and Commands. Getting Started with ADO.NET 4 DataSets. Viewing and Navigating Data with ADO.NET 4 DataSets. 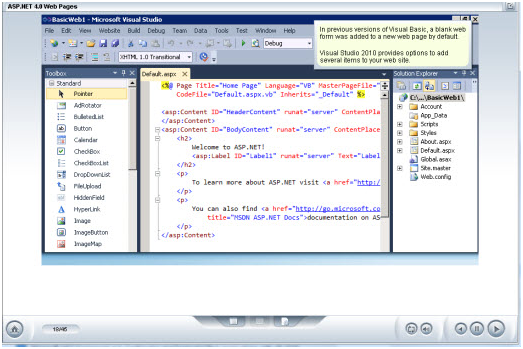 Synchronizing Data and Managing ADO.NET 4 Applications. Working with the ADO.NET Entity Framework 4. Using LINQ and XML with ADO.NET 4 . Getting Started with ADO.NET 4 DataSets Using. Using LINQ and XML with ADO.NET 4. Creating User Interfaces for Windows Applications. Windows Applications Content Creation and Management. Customizing and Managing Multithreaded Applications. Securing and Deploying WPF Applications.